SocialCops was invited to speak at the #BusinessCoalition4SDGs Conference held in Papua New Guinea where we presented our work around tracking India’s progress towards achieving United Nations Sustainable Development Goals (UN SDGs) with the help of data intelligence. The conference, organized by the Business Council of Papua New Guinea, the Port Moresby Chamber of Commerce and the United Nations Development Programme (UNDP) in Papua New Guinea, was attended by different stakeholders in the development sphere such as business leaders, government heads, academicians and development professionals. 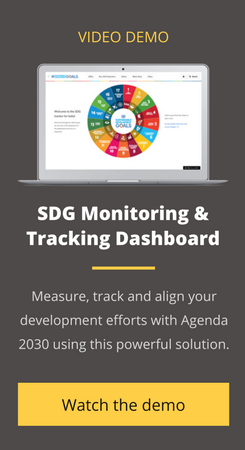 The discussion revolved around aligning current development activities within the UN SDGs framework, as well as exploring the possibilities data and technology possess to track and monitor development performance. We shared our learnings around the use of data visualization in allowing businesses to map and track their social investments. We talked about our work with the Bill & Melinda Gates Foundation who used our platform to invest $8 million in Indian agriculture, and the Ministry of Petroleum and Natural Gas who use our platform to power India’s largest LPG subsidy scheme. This was followed with how business leaders of Papua New Guinea can use data intelligence to facilitate greater partnerships, better collaboration and targeted social impact investments.